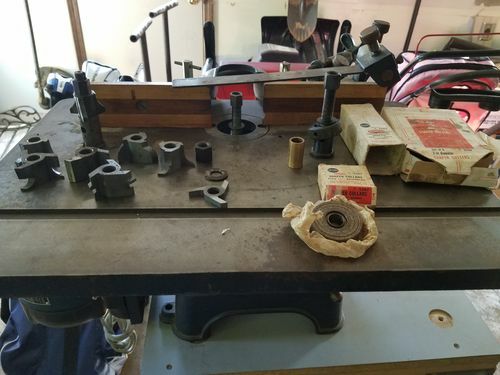 NOS Vintage Craftsman Shaper in great condition! Took a drive this morning to a flea market I’d never heard of after talking to this guy on Craigslist. I was able to talk him down a bit from his original asking price, although not as much as I’d have liked. However this was the last vintage power tool I have plans on putting in my shop. When I got there I realized why he had it priced a little high. The thing was in immaculate condition, surprising considering it’s age. 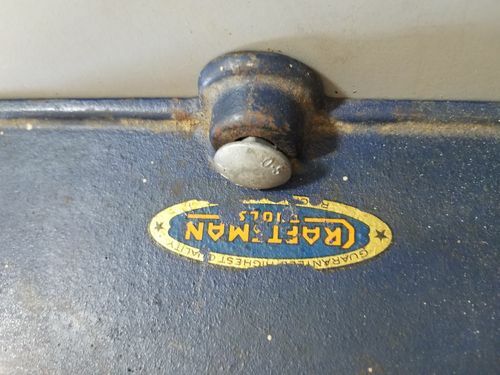 The SKF bearing decal was in great condition. The “Long C” Craftsman decal was a little worn, but still very visible. 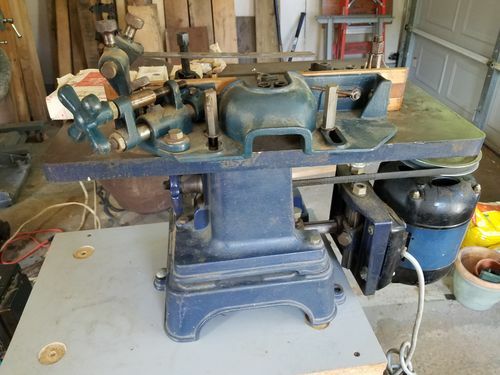 The only experience I’ve had with a shaper was the 80’s Craftsman motorized version my father gave me. It was loud as all hell. This machine made far far far less noise. On top of it there were a handful of cutters it came with, however I know I’m going to have to keep an eye out for many more. looks pretty cool. What is the belt pulley ratio? I bought a new Shopfox shaper about 6 years ago. I wish I could say I use it all the time but most of the work I do hasn’t required it yet. Still it is an underrated and very useful machine. The advantage of the vintage equipment is the quality of the castings and materials that have degraded since manufacturing has moved to China. Here are a couple of tips; Google Roman Carbide for cutters. Also, my shaper has an adapter that allows me to use 1/2” shank router bits in it. It’s basically just a collet housing that screws onto the spindle. This is great for the panel raising bits and larger cut router bits that require a lot of horsepower. I don’t know where you can find one of these adapters for your machine but it is worth looking for especially if you already use a router table and have a large collection of bits. Woodstock International may have something. BTW, I still use a router table even though I have the shaper. Once you start to get a good collection of cutters, you won’t be spending big bucks on trim at the home store anymore. You can just run it across that “potbellied beast in the corner. There are cutter heads out there that let you change profiles too. That way you can have a variety of profiles for a lot less capital expenditure. Also, you might want to build a rolling cabinet with drawers to store all of the accessories that tend to collect around a shaper. Sorry I got so long-winded. Happy shaping and keep the faith in vintage iron! I was curious what speed the cutter turns. I have a shaper that turns too slow and hogs the wood quite easily . I bought a new Shopfox shaper about 6 years ago. I wish I could say I use it all the time but most of the work I do hasn t required it yet. Still it is an underrated and very useful machine. Here are a couple of tips; Google Roman Carbide for cutters. Also, my shaper has an adapter that allows me to use 1/2” shank router bits in it. It s basically just a collet housing that screws onto the spindle. This is great for the panel raising bits and larger cut router bits that require a lot of horsepower. I don t know where you can find one of these adapters for your machine but it is worth looking for especially if you already use a router table and have a large collection of bits. Woodstock International may have something. Once you start to get a good collection of cutters, you won t be spending big bucks on trim at the home store anymore. You can just run it across that “potbellied beast in the corner. There are cutter heads out there that let you change profiles too. That way you can have a variety of profiles for a lot less capital expenditure. Also, you might want to build a rolling cabinet with drawers to store all of the accessories that tend to collect around a shaper. 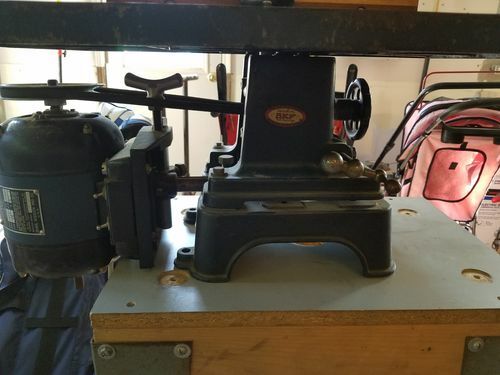 I recently got into woodworking, and was able to put a whole shop together by buying older cast iron machines for (well) under $1000 and I consider many of the tools to be of higher quality than what’s out there today. 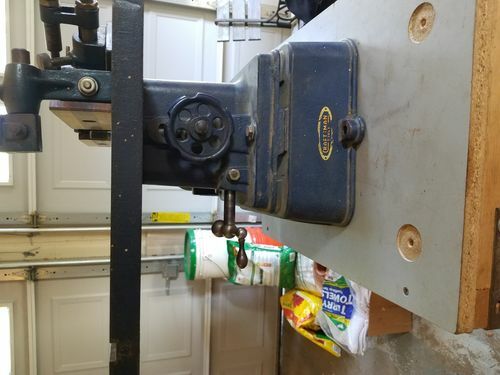 I picked up a Craftsman badged Parks planer for $150 after the lunch-box Ryobi my father handed down to me kicked it. This thing tears through every piece of hard wood I have to throw at it. 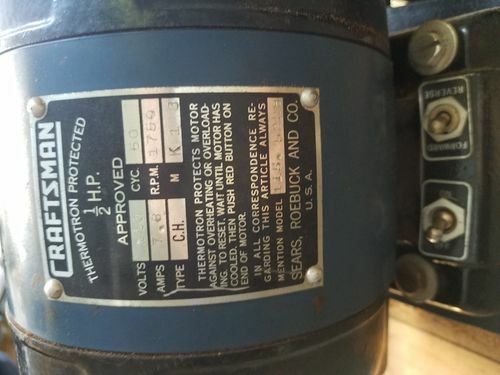 The motor on it is gargantuan, drawing 16 amps. Really excited to get to using this tool! I got real lucky with my tools too. When I was working my way through engineering school as a contractor, I did an apartment in the basement of an old house. Long story short it was the workshop of a deceased master craftsman and I did a labor swap to get the tools. 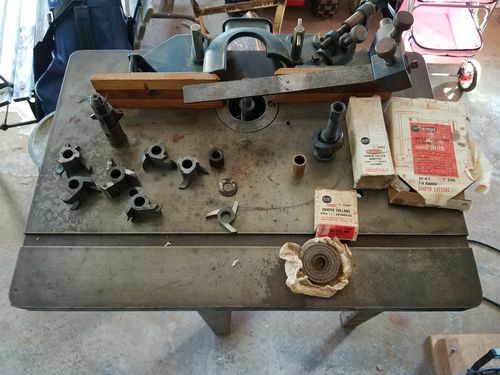 they included a 1937 14” Delta bandsaw, a 1939 12” swing Delta Lathe, and many hand tools. Hand tools included Stanley planes, chisels, and measuring tools. I also ended up with some jigs for bending Windsor Chair arms but that technology outranks me. 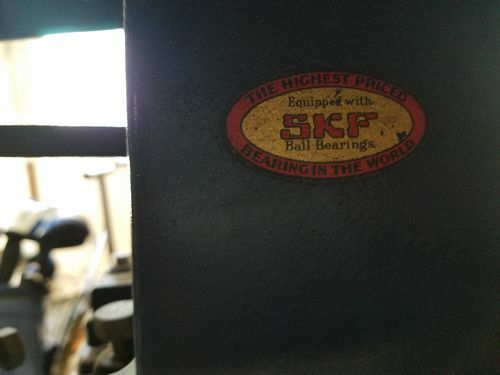 You really gotta love that SKF bearing sticker…”highest priced bearings in the world”!!!!! You know you gotta be fantastic when you print up stickers bragging that you manufacture “the highest priced” anything in the world!!!! Hahaha…not the best bearings or the longest lasting, the highest priced! Good god yall!! On a serious note, are shaper bits universal? That is to say, are they pretty much all the same in how they attach to the machine, or does Craftsman and other brands not interchange? So you buy a shaper, it pukes and now you not only need a shaper, but all the bits too??? I believe they’re universal, however there are different collet sizes, much like router bits. It is based on spindle diameter and height. In general the spindles are 3/4” which is what my Shop Fox is. I have seen 1/2” shaper cutters. The small/old time shapers (C’man, and others) had 1/2” spindles, which was pretty limiting. I think those shapers went away pretty much because the router table, with a good router, supplanted them. 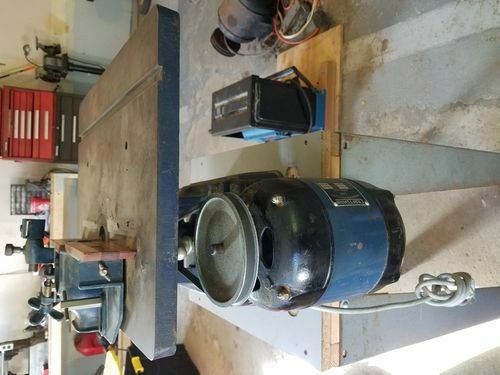 But 2 hp and bigger shapers can have 3/4”, 1” and even bigger spindles, and will swing a much more massive cutter than a router can. The power of the induction motor helps a lot, compared to the universal motor of the router. You can run stuff through a shaper all day long, which I wouldn’t want to do with a router. Some people say the lower speed of a shaper (7,000 to 11,000 rpm, typically) is too slow with a router bit, but I have used router bits in mine and they seem to make a plenty smooth cut. Thanks fellas for the info, it is greatly appreciated!!! I asked because I intend to get a shaper for my shop soon. I don’t want to buy one that takes special or their brand only bits and get stuck that way. There is no such thing as a shaper that takes only self-branded cutters. They are all interchangeable, within the limits of the spindle diameter (1/2”, 3/4” and 1”, with even bigger ones on very heavy duty (industrial) machines). If you use it in a router, it’s a bit. If you use it in a shaper, it’s a cutter.